Tonight there was a little break from the Joinery Bench build. I was a little short on timber and stopped by the store tonight on the way home from work to pick up what was needed, and while I was there I also picked up a board for a small commission piece I've had sitting in the wings for a little while. My best friend's wife wants to teach herself to weave, so to do this you need a loom. Now looms can get very complicated but they can also be very simple. Thankfully she was looking for the simple kind. She found a set of plans for what she wanted in an old craft book from the late 60's. I tried to ask several questions to refine what she wanted but, the plan in the book was it. 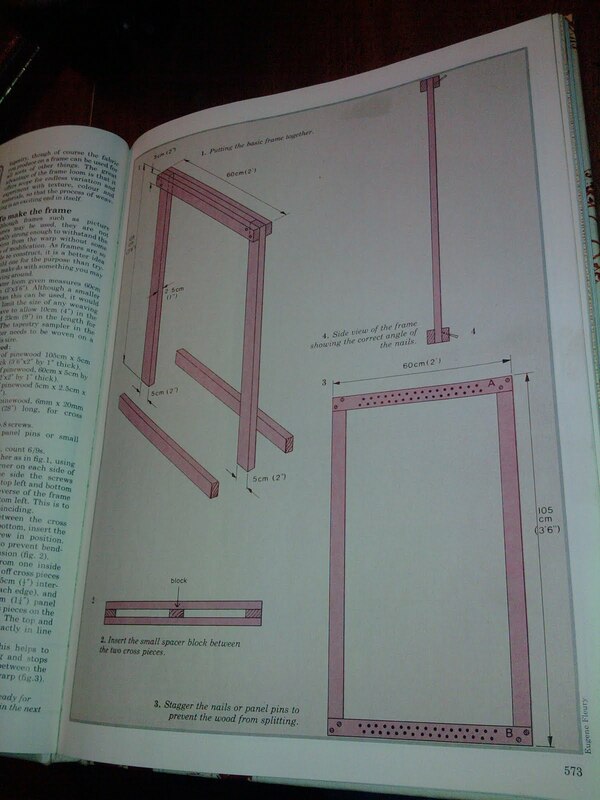 Here's the pic I took of the page with the plans. A very simple plan that is supposed to be joined in the corners with screws. Of course I had to play with that idea a little. At first I was thinking about mortise and tenon, but then I realized that for weaving you would want the elevation difference between the uprights and the top and bottom cross bars. So I decided to remain more faithful to the original plan, only making a small, I guess you could call it a shallow lap joint, to give a small shoulder on the uprights to support the crossbars and help keep the piece square under tension. This needed the strength of a hard wood, and thought I hate buying my hardwood from retail giants, I only needed a 1x4x8 to pull this off. So I held my nose and searched the stacks. At first I was thinking oak or poplar, but I have used those flavors a lot in the past. So I just browsed to find something different that I hadn't worked with before. The walnut was blotchy looking, and there was something I didn't like about the cherry, finally I stumbled across the mahogany. 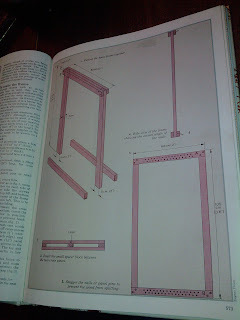 I've never had the pleasure before and since I've been doing a lot of reading about 18th century American furniture lately, and there is a lot of mahogany used in that time period. I decided to give it a try. I can say that I really understand why. It works with hand tools beautifully and easily. I had to rip the 1x4 in half to get started. I know 1x material is thinner than the 2x pine I hand ripped for bench top but I worked so hard to do just one of those boards. This cut so nicely I didn't even work up a real sweat, and I was done in no time. Then after crosscutting the boards to length I ganged them together in the vice and joined the edges first with my German horned plane, and smoothed with a #4. This was to make sure the matching boards were all the same width. Then I set to cut what I'm calling a mini lap joint. I started by laying out the boards where they would fit together and marking where they would overlap onto the uprights. Then I took my gent's saw and cut a very light, maybe barely an 1/8th inch shoulder. Then I knocked out some of the waste to come off with a 1" chisel. Then I used the router plane to get all the depths consistent. Man I have to say that once you start using a router plane, suddenly it's easy to find excuses to use it more. Using it to even an end just required me keeping the weight on the side that was sitting on the original height. I think this plane could just be more versatile than most people let on and I'm going to have to do some digging and exploration to find some more tricks with that puppy. At any rate, a little glue and a little clamp and it's set. Now I have something to work on in the meantime while glue sets and dries on stages of the joinery bench and with luck, a finished loom will be ready for delivery when I see Thom and Ann this weekend.